Palestine, Sagan and atmospheric physics. It’s Christmas 2011, what better place to start than Palestine, a region of many tribes, strife and politics. Before you start, note I am Tim, not Tallbloke. If you have read the title of the plots I guess you are wondering whether I have lost it, a fool, a denier in the face of a human social construct: everyone knows. The Dead Sea region of the near East is the best known area which is far below sea level and is the termination of the Jordan river. Jericho is within the valley at perhaps 550Â 250 metres below sea level. Alas this troubled region has no long instrumental temperature records but there is no question the atmospheric lapse rate just carries on rolling down as well as up mountains. Easy, or is it? There is little science in climatic science, is primarily a matter of faith as I will now show. That is science. Step (3) is missing from climatic but not always. An excellent example of true science revolves around Henrik Svensmark’s cosmic ray cloud seeding ideas. Where is step (3)? That is the CERN CLOUD experiments and similar work. Compare that where there is no (3) or perhaps a large model, which is not a real world experiment. Also keep this in mind. I am familiar with modelling in other fields so a suggestion that GCM are less than 3D is worrying, they don’t handle mass properly and mass means entropy given gravity and water vapour. One to watch, see how it pans out in time. We hear that cry often. Everyone knows it is true. Really? Let’s take an old bloke, how about Newton and his laws of gravity. These laws are universally accepted as true, excluding the limit case (relativity etc.). There is a problem. Yes the laws describe what happens, we can do a step (3) and it works but we don’t know what causes gravity. Go on then, show me a bucket of gravity, you can’t. How does it work? We don’t know. The point is that we accept the laws of gravity on faith without actually knowing, there is an abstract factor. Some mention absolute proofs where they cite mathematics and indeed that is correct, mathematics is a closed world, a human invention and within that closed context a logical proof can be done. With the natural world there is always some degree of simple acceptance of the unknowable. Maybe that is why scientists must remain always sceptical. We do not know whether this is just a story or whether there was such a star so let’s use some words from NASA, A Christmas Star for SOHO published in 2000. A planet is a gravity well where whilst we all live on one it is also an alien concept, everything magically goes downwards, we are too small to see any greater picture from real experience. I’m excluding Mars from the following, saves many words. Figure 2 is an overlay of a published plot of some of the data from the NASA Magellan probe. I’ve failed to find numeric data from the Venus probes, hence I have had to extract this from plot and derive a good enough overall dataset. Note the straight line lapse rate region, above which are high clouds and the thermosphere. Earth-like conditions exist at ~55km. The cloud tops are sometimes stated at -33C. There is a comprehensive report on Venus. Results of Venus Missions, M. Ya. Marov, Academy Sciences, Moscow, Ann, Rev. Astron. Astrophysics, 1978. A scan or PDF is available. This paper is critical. It contains a lot of the Russian Venera information but also contains garbled paragraphs on greenhouse with evidence to the contrary and finally a key, acknowledges C. Sagan. Note the first sentence. The word “responsible” nicely sits on the wall. I am not writing about Sagan at length now but there is a very important back story which cast him in a poor light. Roll the clock back from 1978 to around 1960 and we find that Sagan has just produced his doctoral thesis which is about the solar system planets. His great interest was Venus, more from a sci-fi and biology point of view, a common dream was it might have life or be like earth. With others he declared from radar studies that Venus has a surprisingly hot surface, where up to that time it was thought possibly habitable. I wanted to read his thesis but instead of being on a pedestal as a seminal work I could not find a copy, mysteriously absent, especially from a greenhouse warming proponent and given an often shouted opinion that Venus has suffered runaway greenhouse warming. So I started pressing and a very kind gent emailed a better remain nameless professor who has written about this and it turns out knew Sagan. He replied not with a pointer to the thesis but with a report for NASA dated September 1960 authored by Sagan and about conditions on Venus. Locaton archive.org, not NASA. Extraordinarily the email reply contains an admission that what the professor wrote 10 years earlier is wrong but never corrected, and that Sagan was wrong in implicating water vapour instead of carbon dioxide and that Sagan is validated (contradiction). Bizarre because what he was asked was completely neutral. It took a few minutes reading to spot what I suspected, a massive error in the report. Given likely knowledge at that time this has to be excused but should be have known better? Link to Sagan/NASA report here. The figure of four earth atmospheres also appears elsewhere. Today and as stated in the 1978 data, that figure is quite different, is 23x larger, at 92 atmospheres. That is a mistake in a primary atmospheric parameter, nevertheless Sagan produces maths which show the high surface temperature is caused by greenhouse gases. As I wrote, didn’t it occur to him to check the figures? This is already a long article so I will omit pointing out the things in Marov where shows both what a pure radiative atmospheric would look like and what it actually is. I do though state that radiative is aphysical it is impossible in a gravity field. The lapse rate as we know it is caused by the interaction of buoyant gas and gravity, excess temperature profile, churn starts and removes the excess. Two explanations in ordinary language are here, scienceforums discussion. So how about Jupiter at 5.2AU? Data from the NASA Galileo Probe Atmosphere Structure Instrument, which took me some time to track down. Turns out there are a lot of stories about the data and people, including incomplete information, never submitted, people dying, lot of things. This includes as with most major space projects serious malfunctions, in this case the probe leaked gases but fortunately there was sufficient additional monitoring to validate well enough. Data is here and similar addresses. 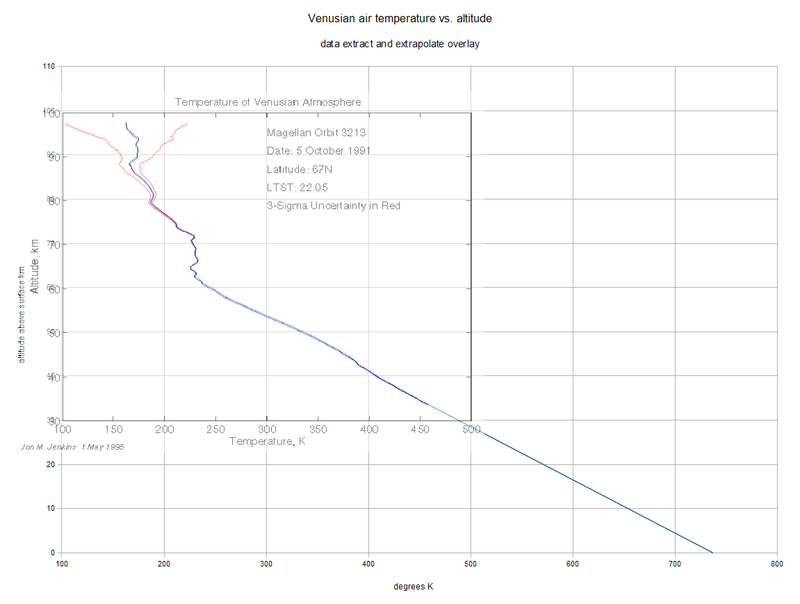 I’ve omitted the outer thermosphere data to make it broadly similar to the Venus plot. Looks to me like a straight line lapse rate. There is wide admission the interior of Jupiter is thought to be extremely hot and then some, thousands or more K. Any material there is under unimaginable pressure and certainly in strange material phases, also sun like. A comment or assertion is that Jupiter has an internal heat source or that it is still cooling from compressive heating on formation. From this there is an implicit “causal” of the measured atmospheric heat. Venus has a carbon dioxide atmosphere, Jupiter does not. I’m omitting discussion of the rest of the Venus “carbon” assertion which ties in to earth catastrophe and tipping point. There is no paleo barometric pressure dataset for earth. This is new and I am watching for publication. S. M. Som, D. C. Catling, J. P. Harnmeijer, P. M. Polivka, R. Buick. The maximum air density 2.7 billion years ago determined from fossil raindrop imprints, Nature, accepted for publication, 2011. – We use fossil raindrop imprints in 2.7 billion-year-old volcanic ash to determine an upper limit on the air density and hence the barometric pressure at that time. The method uses calibration experiments of drops falling into modern, comparable ash. This is the first determination of barometric pressure of a time prior to the modern instrumented era, following Torricelli’s barometer invention in c. 1643-1644. A comment by Brian H gives this link as a minderÂ Was the Atmospheric Pressure Different at the Time of Dinosaurs? I think there are many question marks over atmospheric physics, particularly what is actually a greenhouse. Normalising conditions to 1AU has been done by others, showing the planets are the same. Question: If a 112km deep valley existed on earth, what is the air temperature on the valley floor? The above is a long article where I am sure to have made mistakes, omitted too much. There is also a lot I do not know. Input is welcome. So you are are not a tallbloke. Does that make you a Tiny Tim? Wing and flight characteristics of pteranodons, etc., indicate a ~3X denser atmosphere. It’s not questions we have aplenty, but ignorance. If you read Pierrehumbert’s primer on atmospheric physics for example, he clearly states that radiative transfer is not important in the troposphere, where convection and conduction dominate. We should add water vapor condensation to the lot. We could actually define the troposphere as the bottom of the atmosphere, where the radiative properties of the gases become irrelevant (on every planet, the height below which temperatures follow the adiabat). And so the only place where the properties of CO2 matter, becomes the tropopause. […] the surface and the troposphere are so strongly coupled by convective heat and moisture transport that the relevant forcing governing surface warming is the net radiative perturbation at the tropopause, simply known as radiative forcing. That’s a hypothetical, we assume? That’s deeper than the entire atmosphere. Brian H, changed the valley text slightly thank you and put the link into the article. Aerodynamics tends to have surprises, such as the tunnel wing of the bumble bee which “cannot” fly. Similarly, the metabolic rate might vary more than expected, what for example happens vs. pressure? My guess is the earth originally had most carbon as the gaseous oxide and therefore the atmosphere was much more massive but this was consumed when life started depositing the carbonate rock we have today, and reducing atmospheric mass. This is related to a Venus argument about either did have water and less atmosphere and lost it, or..well lots of ideas. Rolls on to earth will lose the water at the tipping point, we are all going to die. I don’t accept this. Then we have the water comes from comets idea. by John Ackerman. He has some interesting ideas about interpretations of Venus data and especially of a possible sulphur cycle from the surface through the cloud layer. Not sure how to interpret his opening. Trying to get attention or serious? SoD also states that looking at the surface 390 w/m2 olr compared to the 240 w/m^2 olr at TOA proves greenhouse. Sorry, I take nothing he says seriously. kuhnkat – I fail to see how one interpretation disproves the other? Tim – remember Venus has got its own story. The entire planet was resurfaced no more than 500 million years ago, very recently in astronomical terms. One can only imagine the size of the outgassing at the time. As you surely have guessed already, were Earth emit 90 times as much gases as there are now in the atmosphere, the surface would become incredibly hot. The same might have happened on Venus. Gas molecules follow ballistic trajectories between collisions. The Zeroth Law of Thermodynamics does not apply in a gravity well. That isn’t saying the radiative properties of CO2 only matter at the tropopause. An increase in CO2 below the tropopause will reduce outgoing longwave so will induce a net radiative perturbation at the tropopause. Jericho might be hotter because it’s a lower elevation, but that is probably at the expense of making other areas colder. The Earth has to emit as much as it absorbs afterall, no matter what the distribution of mountains and valleys looks like. As an extreme example we can’t expect the oceans to boil if we reduced Earth’s radius by 100km, even though a naive top-down extrapolation of the lapse rate would suggest so. If Jupiter didn’t have such a strong greenhouse effect it’s surface would be much cooler. The lapse rate might not be so drastically different, but it would be starting from a lower surface temperature. Q, you forgot that you have to add a third demension to your trajectory because of the well. Hello again Tim, thanks for the link to my ‘Pot Lid’ essay and its critique of the weirdly two-dimensional character of general circulation models (GCM). Several prominent skeptic bloggers are reading the paper and planning to post about it, but the more mentions it gets, the better, so if anyone visiting here hasn’t had a look, please do. I have some other climate projects planned for the spring. Folks interested in ‘Pot Lid’ may also want to check out my list of future papers at: http://declineeffect.com/?p=263. Before wishing you all Merry Christmas and Happy New Year, I’d like to respond to Maurizio’s point about convection and evaporation dominating within the troposphere, and the radiative energy balance of the Earth being set at the top of the troposphere, where those processes stop. I think you’re right, Maurizio, but then I think a lot of mainstream warmists would agree with you too. To really see what is wrong with climate theory, we need to focus on one particular flaw in the models. The blunder crippling climatology is the way they compute the “output” temperature at the top of the troposphere. They think that a “hot spot” must form there, with temperatures rising faster than at the surface. Instead temps have risen more slowly. “Pot Lid” explains why temps MUST rise more slowly at altitude, and why the models continually get that process wrong. That flying dinosaurs link is amazing stuff. Does PV=nRT apply to the open air (no container)? Surely there are several solutions to the gas equation which involve a higher density. In particular it’s been assumed the higher density (from aerodynamics argument) was due to more pressure, but even if Earth gravity was the same there is still room for a 3x higher density to result from far less than a tripling of pressure via variations in the other variables, such as n, T, and V.
Now I see from WP that the only way to get even double air density by only changing temperature you would have to freeze the air to -100C or lower, so I guess T can stay basically where it is in this equation. 🙂 I think that means this hypothesis cannot be used to resolve the Faint Young Sun Paradox?? This leaves n, V, P. Can we eliminated V as a variable because of the constancy of gravity? Well I think with more particles the volume of gas would extend outwards further. So one possible solution is where n was 4.5X higher and V was 50% larger to give the required density ratio of 4.5/1.5=3, but the pressure ratio would be 3 to make the gas equation balance. (3 * 1.5 = 4.5 * 1) Lots of other simultaneous solutions are possible. Playing with some numbers, a solution for the present day is: At STP the variables work out at V=5.2E19 m^3 and n=1.63E21 mol of some nameless gas. Applying the volume and quantity ratios guessed above the temperature becomes 126K (or -150C) if the pressure is not changed, and 378K (or 103C) if pressure is tripled. Both of these are unrealistic. The volume ratio is a total guess and completely arbitrary, so it is not surprising it doesn’t work out. But still the tripling density state seems difficult to reach by ballpark guessing. How can one put realistic limits on this solution? Is the Ancient Dense Atmosphere hypothesis even scientific? More pertinently where did the extra (eg 4.5X) atmospheres of mass go? It had to go either up or down. If part of it went down, what fixed the nitrogen and is ancient plankton actually responsible for sinking the huge CO2 into gas/coal/oil prior to land plants? If part of the missing air went up, is that the same slow loss that continues today, or was it punched out mainly by the K/T boundary impact? Either way, should we be able to see traces of Earth’s missing air still orbiting the sun? I think a mechanism has to be proposed for the Ancient Dense Atmosphere hypothesis so that evidence can be found. 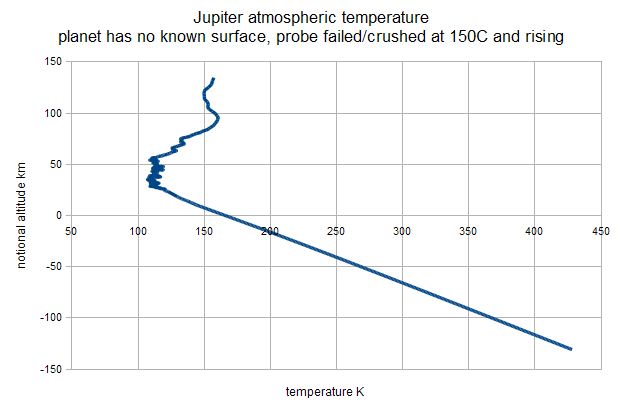 How can you take that Jupiter probe data seriously? If the probe failed, and the sensor data suddenly changes its behaviour dramatically at the 25km mark why would you believe anything it sent back after that point? Surely it is possible the co-incidence with the venus probe line may be more fortuitous than genuine? I keep seeing this “venus disproves the existence of the greenhouse effect” meme popping up again, such as by Harry Huffman. Surely the mainly positive discrepancy between actual venus data and predicted temperature (based only on high insolation) at altitudes above 80km can be interpreted as evidence of a greenhouse effect on Venus? Beyond a certain depth the thick CO2 has almost no further unused absorbing ability because its total absorption spectrum has reached saturation, something which doesn’t happen on Earth, so beyond that depth you don’t see a greenhouse effect. I guess what I’m suggesting is, the pressure argument and the venus data doesn’t disprove an IR radiative greenhouse on venus, there’s still wriggle room there for a +4 or +3 degree effect. The pressure effect just swamps it at high pressure. Is that reasoning flawed in any way? I presume the total volume of air, especially the rather dense CO2 component, was the difference. As for Venus’ greenhouse, as G&T point out, virtually no insolation reaches the surface, so back-radiation of insolation is absent. Insulation, however, is very potent. Lolwot – obviously your English language doesn’t belong to this planet. I’ll stop replying to you here before we start discussing what the meaning of “is” is. This post is a winner Tallbloke IMHO. Which means that some will react of course. Those straight-line graphs are a knockout. And as Huffman points out, the Venus atmosphere at Earth’s sea level pressure is indeed the corresponding temperature to Earth, given Venus’ different distance from the sun. Serendipitously I’ve been mulling the identical thoughts to tchannon over the last few days. Where I live is a flat landscape with magnificent views of ranges of hills surrounding. It’s stunningly clear every time the falling rain approaches zero temperature, that the snow line is straight as a die. So, really, are the underside-lines of almost all clouds. Again very visible from my location. Adiabatic Lapse Rate kicking in, always, always, always. 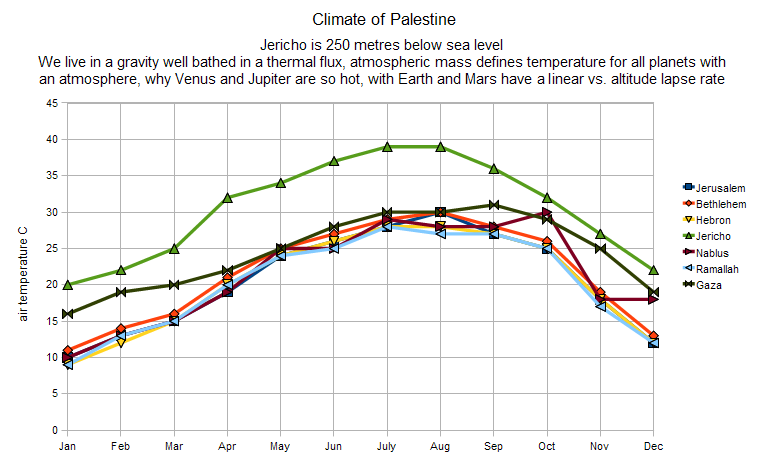 One check: Jericho temperatures: are they really 10-20 deg warmer than those other locations? That’s a lot of heat. How can Jericho dwellers stand it? Interestingly, Jericho was a place that traditionally Israelites would not live – close to their point of entry after their sojourn in the wilderness, destroyed by them all except for the house of Rahab, the lady of the night who took in Israelite spies. And there’s more. Another check: why does this adiabatic lapse rate work with air and not with water? of course, water will not compress… therefore also it does not have the internal turbulence of the troposphere – so the ocean bottom is cold not warm. But deep mines certainly do get hot. And hey, dinosaurs in a heavier atmosphere, double wow. I always had that suspicion. Warmer yes. More buoyant too? And would this mean near-constant cloud cover??? I’m mindful of the possibility of an ancient fly-past, Venus or something that size, that suddenly sucked out a lot of the atmosphere as well as causing unearthly heavy-duty electrical disturbance to form the iridium etc at the “catastrophe” layers imprinted in the earth’s geology. Last cracker. Handcuff Hansen. He was an astrophysicist who bought into the “Venus runaway GHG” stuff and then bounced into Climate Science to help lead everyone astray. Yet IIRC my research shows that the US Venus work suffered severe cover-ups / obfuscations / rewrites at about this point. My EU research flushed out some of this. Lucy you are completely wrong. Venus is warm because of a strong greenhouse effect, not due to the lapse rate. See my comment further up and explain do you really think if we dug away 100km of Earths surface the “new” surface would be 100s of degrees warmer? The mistake is to think that because you can calculate surface temperature by tracing the lapse rate downwards therefore the surface temperature is *caused* by the lapse rate. That’s both illogical and wrong. Surface temperature is determined by the energy balance of the planet, including factoring in the greenhouse effect. The lapse rate starts from such a surface upwards. yes you can trace it back down again, but that doesn’t mean the lapse rate causes the surface temp. A Venus without an atmosphere that absorbs outgoing IR would be much colder. It might have a similar lapse rate but it would be starting at a far colder surface. Lucy Venus is so hot because of the greenhouse effect. Venus actually absorbs less sunlight than Earth, it’s distance from the Sun is a red herring. See my post further up. Cutting away 100km of Earth’s surface would not mean the oceans would boil. Just because you can trace the lapse rate downwards doesn’t mean the lapse rate causes surface temperature. Digging a hole might warm the local area but that will be at the expense of cooling other areas. Surface temperature is determined by a planet’s energy balance, which is affected by the greenhouse effect. It makes more sense to look at lapse rate as starting from the surface upwards. If Venus’s atmosphere didn’t strongly absorb infrared it’s surface would be much cooler. It might have a similar lapse rate but that would be starting from a cooler surface. Lolwot -you have it all lopsided. It’s the temperature (and height) of the tropopause that determines the surface temperature, by way of the adiabatic lapse rate. You can’t start computing at the surface, as eg Jupiter has no surface to compute from. You can extrapolate surface temperature from the height of the tropopause and the lapse rate, but that isn’t an explanation for the surface temperature. Likewise the distance between the Earth and Sun can be calculated using the orbit of Venus, but that doesn’t mean the distance of Earth from the Sun is caused by the orbit of Venus. Andrew McRae, can I take the Jupiter probe data seriously? I spent some time digging around the data and texts concluding it’s a sensible result. You are right to question data goodness. Gas leaking into the probe body was the problem. My background includes many years doing serious electronic design including instrumentation. The probe carried internal monitoring as well so they were able to try and figure out what went on, more about the conditions in which the electronics were operating. Exactly what terminated the signal is unknown, opinion is hull collapse. The “dataset” is actually part of a collection where different range sensors were used so that data from very high down to high pressure could be covered, a fair enough solution to the dynamic range problem. Not sure I’d do it like that but conventional methods tend to dominate in space work. Regarding your musing about gravity, there’s a difference between knowing the “essence” of something and being able to describe that thing’s properties and behaviour (its “accidents”). You can describe “blue” exhaustively, recognize it and forecast accurately what it does, but what’s “blue” actually? You don’t know. But that’s philosophy (epistemology if I recall). In the end, what counts is if your descriptions are good enough to allow anyone to identify your subject and if your forecasts are right enough to have a practical use. Yep, in the end there is engineering, good enough answers. Better have the captain standing on the bridge, it fails, you go down. Definition of the blues: getting into the mind of a blind man the colour of the sky. Since approx. zero insolation reaches the surface of Venus, how can there be a GH effect? Violates the fundamental requirement. “Venus is hot because of the greenhouse effects” say the consensus. B******s say I.
I have studied the story of astrophysicists studying Venus. It’s full of corruption just like Climate Science. That’s part of the reason I can take H D Huffman seriously. Plus if you look at his table of correlations they are extremely impressive. It’s bad science to simply ignore them. I got all my Venus info via the Electric Universe material – yet another area like Climate Science where prejudice rules. I’ve studied the EU material and while I don’t have to agree with all the details put forward by its supporters, the core EU thesis is immensely strong. And beautiful. I used to believe it was greenhouse effect on Venus – natural to START from consensus. Only problem is when one’s determination to hang onto one’s pet belief outweighs one’s ability to consider the evidence. Neither Lolwot nor hmmm have responded to my series of observations, nor to anything on my referenced web page. Lolwot is speculating in all his remarks on this page, not observing. Sounds like you didn’t read the Huffman stuff ? I found it extremely convincing. At a point in the atmosphere of Venus which has the same atmospheric pressure that we have on Earth the temperatures are the same and yet Venus has an atmosphere of nearly 100% co2, and Earth has an atmosphere with .0391% co2. In other words Venus has more than 2000 times as much c02 as Earth. Plainly this is an important observation and means that co2 effectively has no effect on temperature. That temperatures in Jericho some 250m below sea level are higher than the surrounding areas shows that this effect is visible on Earth. It used to be that people pointed (and still do) at Venus as proof that co2 can cause a runaway greenhouse effect, but Huffman’s work shows this to be nonsense. T Channon’s Jericho graph also demonstrates this effect and that it’s pressure not co2. There remains no physical evidence that co2 causes warming, unless constrained within a sealed container, and even that is open to question. “In other words Venus has more than 2000 times as much c02 as Earth. We know CO2 does have a strong effect for a much simpler reason. Venus has a surface temperature of about 420C. That means the surface is emitting over 10,000wm-2 infrared radiation upwards. If venus’s atmosphere did not absorb any of that radiation (ie an IR transparent atmosphere – no greenhouse effect) then all that energy would just escape into space. Ie Venus would be losing 10,000wm-2 energy into space. That would overwhelm the mere 260wm-2 venus gains from the Sun leading to the planet losing a great loss of energy and so to the cooling of the planet. If Venus’s atmosphere did not absorb infrared then it’s average surface temperature could not be any warmer than about -13C. Not on just 260wm-2 sunlight. Venus only maintains it’s very hot temperatures (and high pressure) because the atmosphere absorbs so much of the upwelling IR that only about 260wm-2 reaches space. I read the paper on the cosmic ray-cloud seeding link. Then I thought, hey, if the link is moderated by the Earth’s magnetic field due to latitude then it must be moderated by magnetic field anomalies, especially the South Atlantic Anomaly. Wouldn’t the SAA go a long way towards explaining El Nino? El nino appears to be linked to the solar cycle anyway which lends support to the cosmic ray/ cloud cover hypothesis. But being in the tropics, such a correlation should be weak ( hence the authors’ decision not to include the tropics when formulating the link). However the link would be strong in the presence of a localised anomaly. The SAA is very close by. Any thoughts? Or is this common knowledge? [ I’m not well up on the cosmic ray stuff nor el nino but I’ve haven’t heard of that linkage. To me it sounds like something worth following up. I expect others will comment if they are around at the moment. But in the troposphere, radiative exchanges are not important. Why isn’t the Venus troposphere a-boiling with convective exchanges for example? lolwot: You didn’t study physics at school did you? Our concept of gravity is of the core pulling. What is NOT considered is the forward momentum of the solar system. Any point then lower than sealevel would be under more atmospheric pressure. Velocity differences at the equator generates centrifugal force exerting outward on the atmosphere. My only meaning was pointing at a missing final step, weight = mass x ? in the hope that the gravity of the comment would pull people down. This contains a self reference because as far as we can tell mass creates/is gravity. Presumably if we could go to the centre of the earth we would find we float weightless, with equal pull in all directions. At the surface there is pull upwards from the mass of atmospheric gas, not a lot but the whole thing is strange. I am having trouble following you. If the earth is taken as a sphere of gas (which somehow has the same mass as the solid earth), which is spinning once a day, the outwards force on the gas from centripetal acceleration is insignificant relative to the force of gravity holding the ball together. Similarly the earth flowing in orbit around the sun once a year is a perfect balance. What exactly the solar system itself is doing is a matter of argument. An opinion is in orbit within the galaxy. The galaxy is moving but we know even less about this. The concept, of gravity as a thing, is incorrect. It is an effect, a verb and not a noun. an action and not an object. Think of an electrostatic attraction of dust to a balloon. An atom’s electron shell attracts the nucleus of it’s neighbors and this distorts it’s position inside it’s shell. An atom’s electron shell is it’s center of being and the nucleus is it’s center of mass. This warpage of center of mass from the center of being is the potential for acceleration that is gravity. There are two radiation balances that apply on Earth, Mars, and Venus. Between them, they force the troposphere on each planet to rely almost entirely on convection / evaporation for cooling, and then, depending on what we might call the convective efficiency of that atmosphere, they also determine the surface temperature. The first is the balance between the upward radiation absorbed by the atmosphere (usually called Aa), and the downward radiation from the atmosphere (usually called Ed). On each planet Aa is very close to, but a little larger than, Ed. More importantly, the Aa-Ed gap does not change significantly even with large changes in surface temperature. Estimates for Earth vary between 24 W/m2 (Kiehl/Trenberth 1997) and about 10 W/m2 (Miskolczi 2007). The outgoing radiation is absorbed within a few km of the surface, and all but maybe 3-4 percent is radiated back down. You can think of it as a kind of radiation barrier. This means that Earth, Mars, and Venus are alike in that they cannot get rid of heat by radiating it into the atmosphere. It basically all comes back, apart from a small and almost-constant term. If the atmosphere is not too thick, there will be a “window” allowing some radiation to escape directly to space. But of course Venus doesn’t have a window in the longwave part of the spectrum, and Earth’s window is relatively small, about 17 percent of the outgoing flux. The only other way to permanently get rid of energy is by convection. Now most of the energy that has to eventually escape from the top of the troposphere has to be carried there by convection or evaporation. The Aa-Ed gap only supplies a sliver’s worth. So the absolutely critical question is, what is the relationship between surface heat flux and convection / evaporation? Venus has an extremely low convection efficiency. It emits in excess of 10,000 W/m2 of radiation, but only a few hundred Watts of convection. The surface temperature of Venus isn’t high because it has 92 atmospheres of pressure, or because it’s 96 percent CO2. It’s high because (for whatever reason), the amount of convection rises only very slowly with rising temperature. If Venus were to improve that ratio (more convection per W of radiation, or per K of surface temp), the surface would cool dramatically, all that CO2 and pressure notwithstanding. The greenhouse effect matters because it opens or closes the “window”. People who say there isn’t a greenhouse effect are wrong. But once you have closed the “window” the situation cannot get any worse. At that point convection dominates. 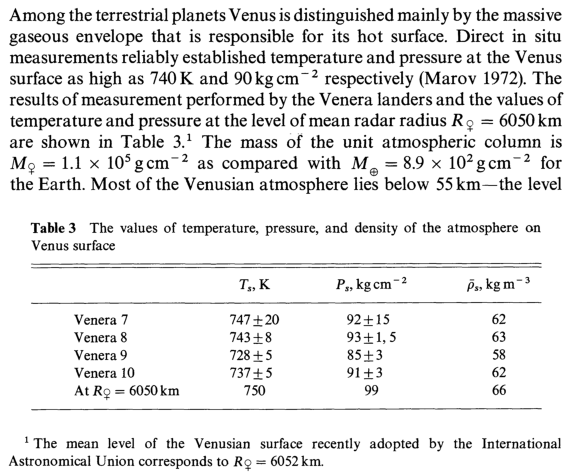 Venus could have a surface temp of 350 K instead of 750 K if only it had a higher convection ratio. There’s a typo in the first paragraph. I meant to say that all three planets rely on either convection/evaporation, or the “window”. Mars relies mainly on the “window,” the other two mainly on convection/evaporation. This is good stuff Dean, where I don’t know whether you are right or wrong but I do know this needs understanding. I would suggest reading the below pdf on cause of planetary surface temperatures. pg, noted and things in progress, expected result unknown. There’s a typo in the first para of my previous post. I also ought to clarify that we don’t really know the precise values of Aa and Ed on Venus. Debate about the nature of convection on Venus is also ongoing. But we can work out fairly easily that the net Aa-Ed difference on Venus ought to be very low in percentage terms. It has to be, or Venus would cool itself off in a relatively short time. 1. For there to be greenhouse warming, the sunlight must penetrate in order to warm something which then radiates LWIR. There is no evidence that enough sunlight reaches the surface to result in any heating. Given that some 70% of the radiation Venus receives is reflected before it ever penetrates, there really isn’t much there to generate a lot or heat with. 2. As for Earth’s surface pressure, I find that completely plausible. The earth has, from time to time, flood basalt events that release a lot of gas (or at least, I would expect them to). Also, the Earth’s magnetic field can be rather unstable and/or nonexistent at times allowing atmospheric gases to be stripped away by the solar wind. But erosional scrubbing may explain most of it. Much of those atmospheric gases might now be locked up in the vast deposits of limestone, gypsum, and marble, chalk, and alabaster that we have on this planet. Some places such as one not far from me near the Black Rock Desert have absolutely huge deposits of gypsum which may have formed by the reaction of limestone with sulfuric acidic water occurring from both volcanic springs and/or from sulfuric acidic rain. My guess is that erosional processes eventually scrubbed a lot of it out with solar stripping during periods of no magnetic field taking the rest. Venus was never a Water planet and therefor has no evaporative cooling system. The Earth is a water planet and the total surface system is based on the characteristics of water. The temperature of the oceans is set by the surface pressure of air on water as the oceans act as the “evaporator” of the refrigeration system that moves energy from the surface to the upper troposphere “condenser” to be radiated to space. As the pollution in the oceans is buffered together it precipitates out. Mars is an almost water planet, too small to hold vapor pressure on a liquid ocean and too small to maintain volcanism recharge of it’s atmosphere. Hmm, I only really question one sentence in that — evaporation being set by surface pressure. I can see that in a broad, cosmological sense you might argue that only a planet with an atmospheric blanket can maintain an ocean. Sure. But on a detail level, it’s local air density that influences evaporation, by varying local temperature. Pressure basically stays the same all the time, apart from little things like El Nino or the non-spherical shape of the Earth. The standard models handle pressure reasonably well. What the IPCC models don’t do well is density shifts. If we don’t model the redistribution of air up and down the air column correctly, nothing useful is going to come out of the models. Here is the followup article to that one about atmosphere being thicker during the time of the dinosaurs. The idea here is that maybe Earth started with an atmospheric pressure of up to 90 bar. I’d say it probably also needs a magnetic field. Thanks, George. Great links. Beware Azolla! It monopolizes the CO2 supply and starves out the rest of the planet’s flora. The thing about Venus is what is keeping its atmosphere so thick. It must have ongoing volcanic activity because its atmosphere is being stripped by the sun at an amazing rate. Having no magnetic field and being closer to the sun, its atmosphere can be blown away fairly quickly (in a relative sense). Why is it so thick? Or could Venus simply be in a period of magnetic field reversal? The 90 bar atmosphere of Venus is pretty close to what was speculated to be that of Earth in a link above from tallying up the atmospheric carbon deposits we have on land and in the ocean. But the fact is without a magnetic field, something has to replenish that atmosphere. Not quite correct I’m afraid George, as it does in fact have a small one. Earth losing atmosphere faster than Mars or Venus. Looks like the magnetic field can work to channel molecules out of the atmosphere. “I would suggest reading the below pdf on cause of planetary surface temperatures. Marvellous post right there. You communicate the situation very clearly. I think the last two paragraphs sum up the whole AGW debate and the current state of the science. Venus’ atmosphere is in super-rotation, ie it circles the planet much faster than the surface…I wonder how much frictional heat that is generating? I looked at density, electro-magnetics and pressure had to regard them as minor players to gravity. All these areas, exert to the planet surface and we should be just chemical compounds stuck on the planets surface with no abilities to move or circulate. Motion is they key player being disregarded in all these areas. Speeds of motion generate centrifugal force which is the ONLY energy exerting to counteract all the other players. This is generated by the planets speed of rotation. The slower the rotation, the less centrifugal force. It is estimated that our solar system travels at 300km/sec, yet this is not considered. Even though we can regenerate similar motion. This speed difference every time we drive a vehicle, we generate many different fields of stored energy due to the many different materials our vehicle is created from. Materials are compressed(especially gases) into compressed states. Fuel is not in it’s natural state but is compressed by atmospheric pressure and the motion of our solar systems forward momentum. Circulation is from the largest circumference(the equator). I was negligent in including the compression generated from creation of stored energy which is slowly released when we slow under the planets surface. As we slow, gravity is increasing due to density changes and less centrifugal force to counteract this. Note to those using Smilies or trying to. The essence of the Greenhouse hypothesis was always that the long wave radiation, being trapped by certain gasses, results in the extra warming above the black body temperature of a planet. It is thus not, repeat not, sufficient to show only that radiation is being blocked by the greenhouse gasses (the Tyndall effect) or that back radiation does exist and is measureable, to proof this hypothesis. It is necessary to show that this (back, trapped) radiation actually causes extra warming of the surface – the latter is only assumed by all the proponents of the greenhouse effect from Arrhenius onwards and was never experimentally proven. Woods, who did the first experiment disproving this hypothesis, not long after Arrhenius proposed it, understood this. For a body to gain heat it needs to retain internal energy. Where does this extra energy then come from, in the case of radiation? We get a clue when we compare the wavelength being absorbed by the surface of a planet, which is short wavelength solar radiation and the emitted radiation, which is longer wavelength infrared radiation, where the two wavelengths virtually do not overlap. Bering in mind that the energy of radiation is proportional to its frequency, according to E= h f; where E = Energy of the wave, h = Planck’s constant and f = the frequency. The energy difference between the incoming and outgoing radiation is the energy retained by the surface as internal energy, thus heating it. When however long wave radiation is emitted back to the surface by the greenhouse gases, this radiation will have the same frequency as that originally emitted from that surface. We thus will not have an energy difference, which can be retained and the surface cannot gain extra warming from it. The back, trapped radiation is certainly part of the energy budget of a planet, but it is not part of the heat energy budget. Bottle A is a Dewar bottle, witch is closed with a movable but gas tight piston, it is _thermal_ isolated. Bottle B is a very stiff bottle witch is isolated from the outside pressure, it should be made from a well thermal conducting material, f.e. aluminiumoxide. This bottle is _pressure_ isolated. Inside both bottles are pressure and temperature measurement equipment and of course a third set is outside, this testbed is situated onto a cage, similar to the meteorologigical observation points. Now, we go up to sea level over a depression (let’s say above Jericho), with a heli. We fill both bottles with the air in that level, seal them accordingly and fly down to ground. We fly to ground and measure pressure and temperature, the thermal conducting bottle we must let settle until the gas inside has the same temperature as the air on the ground. This different times to settle (pressure==immidiate, temperature==counduction dependent) would be an extra term in our (we hope to create) world-climate-formula. which witches were you thinking of employing? Bottle A is a Dewar bottle, which is closed with a movable but gas tight piston, it is _thermal_ isolated. Bottle B is a very stiff bottle which is isolated from the outside pressure, it should be made from a well thermal conducting material, f.e. aluminiumoxide. This bottle is _pressure_ isolated. Inside both bottles are pressure and temperature measurement equipment and of course a third set is outside, this testbed is situated onto a cage, similar to the meteorological observation points. Now, we go up to sea level over a depression (let’s say above Jericho), with a heli (not a witch – witches are far too fast!). We fill both bottles with the air in that level, seal them accordingly and fly down to ground. We fly to ground and measure pressure and temperature, the thermal conducting bottle we must let settle until the gas inside has the same temperature as the air on the ground. If I remember correctly 1.5% of solar irradiation hit the surface of Venus (Russian data). Nothing is violating the fundamental requirements whatever that is. Energy dissipation is trying to equalise the total energy per mass unit getting ALR close to -g/Cp. Condensation processes are secondary in magnitude affecting ALR. My text in capitals for clarity. “We know CO2 does have a strong effect for a much simpler reason.